Corporate staffing services, career advisory department, in collaboration with the Rotaract Club at the University of Nairobi Lower Kabete campus on Wednesday 6th 2017, held a career talk on how to swiftly transition from campus into the corporate world. The Rotaract club is an international organization comprised of voluntary service clubs for young people aged between 18 -30 years that fosters leadership and responsible citizenship. This club has brought together more than 500 university students on a non-academic basis so that they can grow in skills, share experiences and generate creative ideas of giving back to the society. The Rotaract club felt the need to seek the services of CSS in effectively preparing them for the saturated job market. Speaking during the event, the C.E. 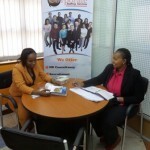 O & Managing Partner of Corporate Staffing Services Ltd , Perminus Wainaina shared information on common job seekers perceptions and practices that cut them off from professional growth and denies them a fair entry into the job market. Developing a professional CV, involvement in various activities and volunteering: You just have to be a self-starter. At the end of the career talk, the common agreement in the room was that interactions with others in work-life opens one up to the real challenges and characteristics of work-life enhancing their transition and making them fit for work-life in future.